"Solo Artist". Solo Exhibition of Urban Landscapes in the museum and historical home of the renown artist Edward Hopper. Edward Hopper Art Center. September 2015. "Festoonology". Landscapes in paintings and print based on locations along the Hudson River. Piermont Straus Gallery. September 2015. "Summer Group Exhibition". A group exhibition of Gallery artists at Transform Gallery in New Rochelle, NY. Transform Gallery, New Rochelle, NY. June 2015. "Summer Invitational". Group exhibition of painters. Art Essex Gallery, Essex, CT. September 2014. "Between the Boroughs". Group exhibition of artists urban landscapes based on all five boroughs of New York City. George Billis Gallery, New York, NY. July 2014. "Bridges, Rivers and Towers -Solo Exhibition". A solo exhibition of recent urban landscapes and prints. Piermont Straus Gallery, Piermont, NY. January 2014. "Starting Small Summer Exhibition". Porter Gallery, New York, NY. August 2013. "Views of the City". George Billis Gallery, New York, NY. July 2013. "Summer Art Fair Invitational". Transform Gallery, New Rochelle, NY. July 2013. "January Invitational Group Exhibition". Art Essex Gallery, Essex, CT. January 2013. "Les Paysage-French Landscapes-Solo Exhition". St. Asaph's Gallery, Philadelphia, PA. January 2013. "On the Horizion-Contemporary Landscape Painting". Curated and participated in group exhibition of contemporary landscape paintings. University Center Gallery. December 2012. "City Block II". Invited group exhibition of New York landscape Artists. George Billis Gallery, New York, NY. July 2012. "Art and Inspiration: Art of the Brooklyn Bridges". Group exhibition of artists inspired by Brooklyn Bridges, in print, painting and photography. Grand Army Plaza, Brooklyn Library. July 2011. "Solo Exhibit". Solo Exhibit of paintings and prints. Earlville Opera Center, Earlville, NY. July 2011. "French Landscapes". Solo exhibit of French landscapes in painting and print. University Center, Adelphi University, Garden City, NY. March 2011. "Small Works Invitational". Exhibited in the Small Works Invitational. Was lead curator in the organizing of exhibition. The Painting Center, New York, NY. December 2010. "Print Works, Group Exhibtion". A group exhibition of artists' work in print. Barrett Art Center, Poughkeepsie, NY. July 2010. "States: Printmaking Exhibition". An exhibition of the printmaker's process. Sharon Goldberg Contemporary Art, New York, NY. December 2009. "Urban Structures". Curated by Kellyann Monaghan. An exhibition of artist's inspired by urban landscape and architecture. Adelphi University, Center Gallery, Garden City, NY. November 2009. "Exotica / International Group Show". A group of international artist in conjunction with A-Forest Gallery. Kyoto, Japan. August 2009. "Unison / Three Painters". Exhibition of painting. A-Forest Gallery, New York, NY. February 2009. ""Black and White"". A group exhibition of contemporary black and white prints. Sharon Goldberg Contemporary Art, New York, NY. November 2008. "Aesthetic Encounter in London". International cultural exchange exhibition of multi-media work. Lennox Gallery, London, England. November 2008. "Urban Monotypes / Solo Show". An exhibition of Urban Monotypes. Raandesk Gallery at Masurlaw, New York, NY. September 2008. "International Group Exhibtion". A group exhibition of international artists sponsoered by A-Forest Gallery. Gallery Schillerpalais, Berlin, Germany. April 2008. "Three Person Exhibit". An exhibit featuring current paintings and prints. A-Forest Gallery Manhattan,NY. February 2008. "CRBE/ Lower Manhattan Cultural Alliance Exhbit". A group exhibition of artist's depicting New York urbancapes. CRBE Building, Manhattan, NY. December 2007. "Art and Living". A group exhibition. Raandesk Gallery at Greenwich Club Residencies, New York, NY. November 2007. "Miscellany Exhibit". A group exhibition in collaboration with Raandesk Gallery of New York. Mana Fine Art, Jersey City, NJ. October 2007. "Beyond New York in Tokyo". An group of exhibition of New York artists, associated with A-Forest Gallery of Manhattan. Tokyo, Japan. June 2007. "Beyond New York in Paris". A invited group exhibition of New York artists to Paris. Ivy Gallery, Paris, France. December 2006. "Three Person Painting Exhibition". An exhibit of urban landscape paintings and prints. A-Forest Gallery, Manhattan, NY. October 2006. "Brooklyn Landscapes, Paintings and Prints". An exhibition of Brooklyn centered landscapes and prints. Grand Army Plaza Library. November 2005. Kellyann Monaghan was born in Philadelphia, Pennsylvania. She is a painter of both urban landscapes and natural landscapes. She received her BFA from Moore College of Art Design and MFA from Brooklyn College, CUNY. Kellyann Monaghan exhibited her work in numerous solo and group shows nationally and internationally. Exhibitions of work included: Cerulean Arts Gallery, George Billis Gallery, Edward Hopper House Gallery, Porter Gallery, Grand Army Plaza Brooklyn Library. She recently exhibited at a solo exhibition at Edward Hopper Gallery in Nyack, NY. Kellyann's monotype prints were exhibited Rye Art Center and Site: Brooklyn Gallery in 2016. Solo exhibitions exhibited at Piermont Straus Gallery in the Hudson Valley area of New York from 2014 to present 2018. 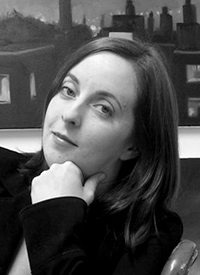 Kellyann Monaghan is currently an Associate Professor and Chair of Art at Adelphi University in Garden City, NY. I use landscapes as a journey and stage for the drama of light, air and movement. I attempt to see past the structured spaces into the otherworldly qualities of the landscape. I am intrigued by the way light plays on the landscape, energizing and describing form. There is a mystery in the dynamics of light, weather effects and atmosphere in contrast to the pastoral places. My most recent landscape work depicts the effects of weather changes on the landscape. The stormy weather and extreme weather conditions invading the natural landscape is a forceful trajectory in my painting and prints. The surface of the landscape paintings and prints erupts with textured and expressive gestural marks. The weather is instinctive inspiration for my tendencies as a “wet into wet” painter and monotype printmaker. My aim is to maintain an element of spontaneity and directness in the print. A fluid and spontaneous quality in the every mark is very important to me. I primarily work alla prima in the painting and the process of monotype. I edit, emphasize and exaggerate structural and organic forms while using the subtractive process. The process allows for idiosyncratic and unexpected painterly qualities to occur. The nuances of light and atmosphere generate a constant awe and surprise. At times the awe is unsettling and other moments beauty found in unexpected places. The creative process is not just an analytical process for me, but is a revelation in every visual moment. I am committed to teaching introductory and beginning students as well as advanced students in the Fine Arts. It is rewarding to guide and watch students develop through unique challenges and creative problem solving skills. I beliieve in teaching introductory painting and drawing sets students up for core skills that will help them in more advanced classes as fine artists. I strive to give students a solid foundation of drawing and painting skills. I attempt to give them a balance of challenging creative processes and individual guidance. My desire is to hold the students to high productive standards and rigor. In the advanced courses I challenge the students to reflect on personal ideas, while building contemporary and art historical references. Piermont Straus Foundation Grant for solo exhibition at Piermont Straus Gallery, January 2014.